This month we’re showcasing some new material that has recently been uploaded to our Transcription Desk. Volunteers can now feast their eyes on over 1,500 newly digitised pages of Bentham’s writings, as contained in boxes 108, 143, 157 and 159 of the UCL Bentham Papers. 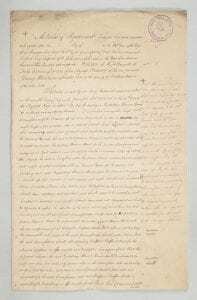 These papers encompass Bentham’s writings on crime and punishment, as well as some draft pages from his work analysing legal codes. Our Transcription Desk now holds 90 boxes of Bentham material, comprising more than 44,000 page images! So what can volunteers expect to find amongst this new material…? Box 108 is a collection of miscellaneous material written by Bentham in the late eighteenth and early nineteenth century. It includes writings on diverse subjects such as colonisation, the French Revolution, political economy and legislation – something for everyone indeed! Boxes 143 and 159 both focus on the subject of punishment. Bentham became intrigued by this matter early in his life and started to philosophise about it in the mid-1770s. He envisioned a penal system where each punishment would be proportionate to the offence and where each offence would be clearly defined and publicly known. Box 159 also contains some French writings relating to Bentham’s Projet for a complete code of law. Box 157 is largely centred on the Panopticon prison, one of Bentham’s most notorious ideas. Bentham planned a new type of prison, where he believed that the nature of the building would help to reform the behaviour of the prisoners. He envisaged a circular structure of cells, with an inspector stationed in the middle of the prison. The prisoners would be aware that they could be being watched at any time but would never know exactly when they were being watched. This would keep them on their toes and on their best behaviour. The papers in this box provide evidence that Bentham’s ideas were taken seriously by the British government. There were various negotiations over the costings and location of the prison and as Folio 83 below shows, even an Act of Parliament confirming that the prison would be built. Unfortunately for Bentham, all these plans never came to fruition. The Panopticon remains a provocative philosophical idea, even if it was never a physical reality. Box 157, fol. 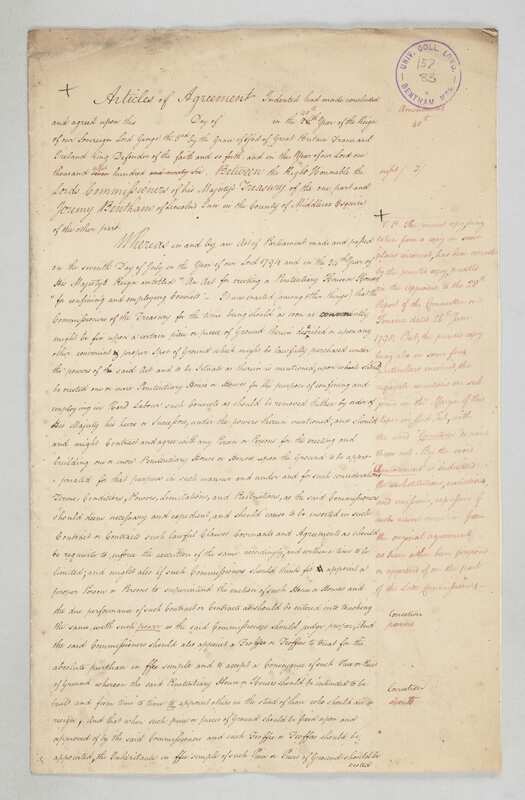 83, UCL Bentham Papers, Special Collections, University College London. Image courtesy of UCL Special Collections (Click to enlarge image). Users can also view pages from these boxes through the Untranscribed Manuscripts page. We wish you all best of luck with your transcriptions. And if you uncover something interesting, let us know by email and we will gladly feature it the Transcribe Bentham newsletter as our Transcript of the Month.